Do you know what a Email subscribe box or Subscription Form is? A box which brings high traffic to your blog. People just put their email address in an ordinary box and then click on the "Subscribe" button and then, they would get all your blog's new material right on their email's Inbox and if you have feedburner's summary feature enabled, they will come to your blog by reading an interesting heading on the reached email. Subscribe box from a hyperlinked text. Subscribe box from a hyperlinked and floating image. Subscribe box on a pop-up box after few second a visitor reach at the page. Subscribe box when a visitors goes to exit from a page (Lightbox Popup). Subscribe box on sidebar as a widget. Subscribe box below every post. Subscribe box on a floating hidden frame. Subscribe box when a visitor reach at the end of the page. Let?s describe these 8 ways and also, how to add them in your blogger blog one by one! Its like hyperlinking a text but instead of a url, we'll put a subscribe box's link on it that will show a nice subscribe box when clicked. When your blog's visitors will click the hyperlinked text, a small beautiful and light weight subscribe box will appear with a subscription teaser and of course! with a subscribe box and a subscribe button. You can use this on your blog's header and hyperlink a text like 'Subscribe Us' so that, when a blog's visitor click the 'Subscribe Us' text, a small box will appear and ask the email of the visitor. DEMO: See live demo here. Now, you have to add some CSS (Cascade Styling Script) to make the subscribe box beautiful. Search for ']]></b:skin>' on your template. Now, this is the time to add the main html that is required for this subscribe box. Replace tntbystc with your feedburner username. You can replace text by editing the highlighted code. How to hyperlink a text to show the subscribe box? Done! You can check it by going on your blog and clicking the text or image for which you have used the above code. Note: This hyperlink can be added multiple times on texts on same page. Instead of hyperlinking a text, why not we hyperlink a floating image? This will attract your visitor's eyes too! This time, an floating image will appear at the left-bottom or right-bottom or left-top or right-top of the page. 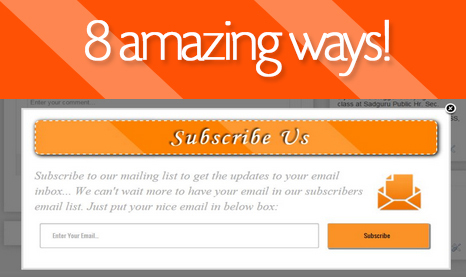 When a visitor click on that image, a nice subscribe box will appear teasing them to put their email in the box! To make this subscribe box good looking, you have to add some CSS codes. Search for "]]></b:skin>"
Paste the following code above "]]></b:skin>"
Now, to make the floating image appear, search for ?</body>? Paste the following chunk of code above ?</body>? action="http://feedburner.google.com/fb/a/mailverify" method="post" onsubmit="window.open('http://feedburner.google.com/fb/a/mailverify?uri=tntbystc', 'popupwindow', 'scrollbars=yes,width=550,height=520');return true"
<input name="email" placeholder="Enter Your Email..." required="required"
Save your template and you?re done! If you want that image to be displayed in left, then change right to left in above code. If you want that image to be displayed in the top of the page, then change bottom with top. If you want to change the text or subscription teaser, then just replace the highlighted code. Change tntbystc with your feedburner username in above code. Sign up by filling the fields (email, passwords and website) and click on red 'Sign up for free' button. On next page, click on that green 'Create Widget' button and choose 'Subscribe' from the dropdown. Choose and modify your settings while creating the Subscribe Widget and at last, click on 'OK' button. On the next page, click on 'Activate Now' button, So that, it will activate the subscribe widget. Now, are you able to see a red colored bar? (as shown in below picture). Click on that black ?Install? button. After clicking on 'Site Setting', you will see a Mail Chimp option on the screen. On the given box, put your Mail Chimp's API key, click on Connect button. After modifying your settings, go to 'Behavior' tab from the widget creator. Choose & tick ?when the user is leaving the website? Click on OK button and you're done! Add a Cool Feed Icon and Subscription Email Form to the Sidebar in Blogger! Do You Like This Story?" - Best Blogger Widget! Did you ever seen floating Facebook like box near scroll bar?. Yeah! why not. floating Facebook like box is today one of the most famous & lovable widget of bloggers. Today, we are going to tell you a widget which works same as that Facebook like box but the difference is, this time, it is floating subscribe box. Now, leave the title box empty and move on content field. Customization:- Replace 'tntbystc' with your Feedburner username. This way of showing a subscribe box on blogger blog when a visitor reach at the end of the page can also help you in collecting some good subscribers. You can add this to your blogger blog by simply doing one step after doing all steps from way #3. Look at way #3's image and you will see an option- 'when the user reach at the bottom of the page? (option three); tick that option and click on OK button and done! When your visitor reach at the bottom of the page, a nice subscribe box will show up on your blogger blog. Shivansh Verma Skv is a 13 years old young blogger and a ninja member of "Blogger Help Forum". He loves to write about technology and web development. He has his own blog- Blogger Guiders You can connect with him on Google+ and Facebook . Thanks! Thanks Dear @Raza for your kind words and it totally depends on you. You can change the settings of pop-up boxes from GetSiteControl's widget creator (on behavior tab). I got a little problem. I tried #1 and #2 method for my blog copied given script. yes Mr, it's don't work popup ststem..
AMazing.. Keep up the good work.. This Trick is really awesome.. Thanks! This is really an awesome tutorial.